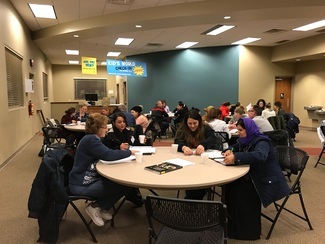 North Pointe Community Church hosts an English class on Monday nights. This class is specifically for the Yezidi population of Lincoln, Nebraska. We meet at North Pointe (2224 Fletcher Ave) from 6:15-8pm on Monday nights. We need volunteers to be drivers, English speaking partners and childcare workers. There is no prep work for English partners, all materials and lessons will be covered during class time. We will also be starting a male conversation class! We hope to have some Yezidi males attend to work on their English skills and enjoy some interaction with others. There will be 2 childcare rooms, one for up to preschool. The other for Kindergarten and above. All volunteers (over the age of 18) must have a background check completed before participation in the class. Please contact Mandy at [email protected] for the background check form, ASAP. Please allow at least one week for processing. If you are interested in driving students to class, please note (in your reservation) how many places you have in your car and how many child carseats you have and leave your cell phone number for contact. Transportation assignments will be given Monday afternoon. If carseats are needed and you do not have any, we will provide them. If you are interested in driving the North Pointe Church van, please email [email protected] for more information. Drivers can also volunteer in other capacity during class. Drivers are willing to pick up students and take them home after class.